This long-awaited revolution against Corum Rath began in earnest two issues ago…then the action was paused while Corum Rath went into the deepest part of Atlantis to get super-powerful evil magic that turned his BFF into a hideous and compliant monster. So I hope things are really popping off in this issue! Find out by reading my review of Aquaman #35, commencing thusly! Turns out that while Corum Rath and Kadaver were walkin’ and talkin’ last issue, the revolution continued outside the palace walls unabated. 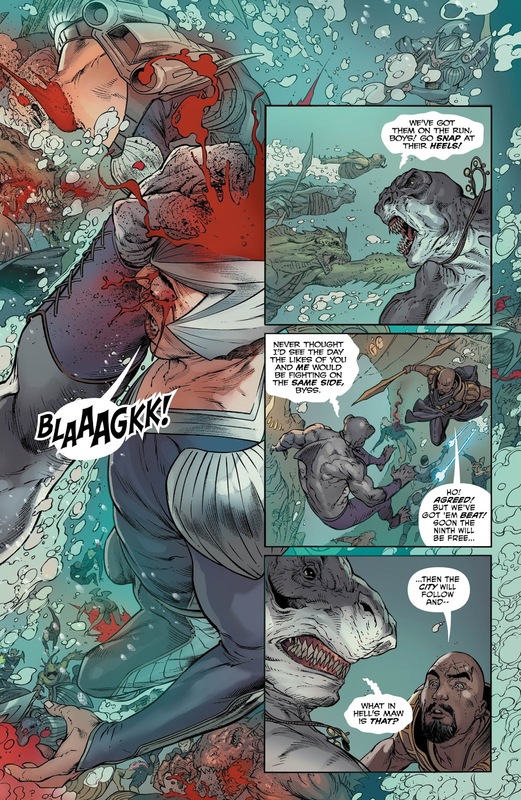 King Shark and his crew of taint-bloods (their word…though I think folks from the Ninth Tride are trying to take it back) are ripping Corum Rath’s goon squad to shreds, and it looks like things will turn in their favor—until Kadaver shows up, looking all gross and like a rejected design for Metamorpho. Now, though, he doesn’t shoot elegant strands of pink coral that can ensnare a victim, but just rages against folks until blood sprays or they vomit, whichever comes first. 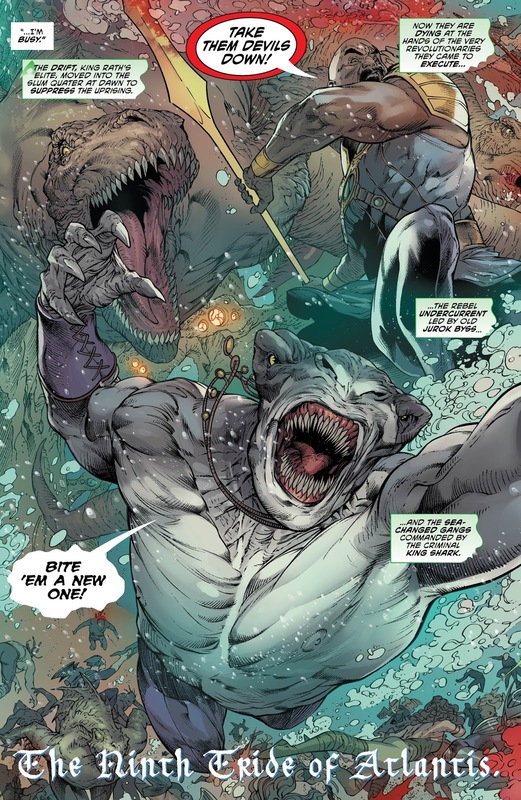 Aquaman shows up to pitch in, and that’s when Corum Rath, speaking through Kadaver, turns his rank-and-file guards into gross, misshapen Manchurian Candidates that will do his bidding. Which they were already doing, but I guess not earnestly enough. By showing himself, Murk has to take down Aquaman per Corum’s orders. 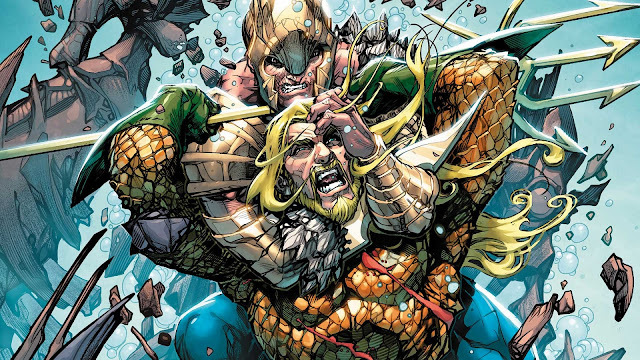 While fighting, he explains that he only fake-stabbed Aquaman initially, and then stuck him off to the side in hopes that he wouldn’t return—see, Murk didn’t want to kill Arthur, but he thought he was not right to be the King of Atlantis. So, uh, you just threw him in a ditch and hoped for the best? What made you believe that Aquaman would simply slink off once he woke up from his prematurely-imposed death? Seems like you might have thought this one out a little better, dude. Over at the Widowhood, they’re pissed off over one thing or another. So what else is new? Corum Rath appeals to the hoary ancient magic that bestowed his power, and asks for more of the same—which the ancient font of wizardry is happy to give. But in doing so, it mutates Corum Rath, turning him into one of the very taint-bloods that he despises! When his council shows up to make some sternly-worded comments to Corum about his leadership style, Corum reveals himself as the tentacle-having beast from hell that he has become! Wuh-oh—maybe something will happen now! Or, more than likely, nothing of great import will happen. 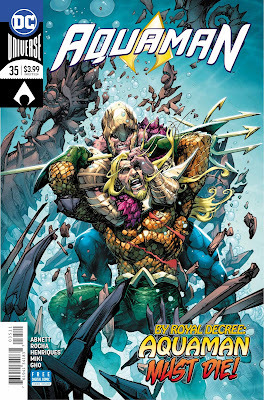 Corum and Aquaman will face off, Arthur will be on the ropes for a while, then by the second-to-last page he’ll run through Corum Rath with his magic trident, and all will be fine. 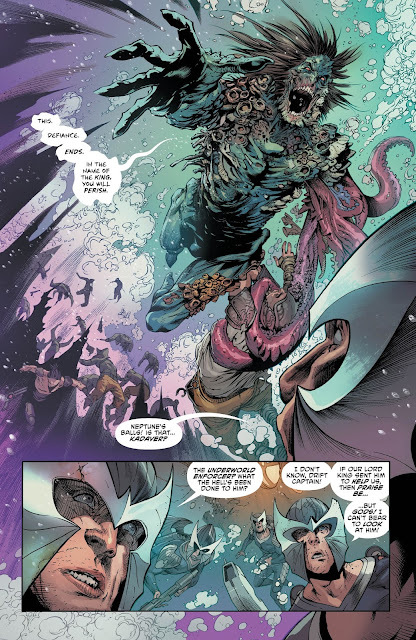 The solicits for this claim that Corum Rath is getting his power from the Dark Multiverse, revealed in the recent DC Comics event Dark Nights: Metal, but I haven’t seen evidence of this at all. This thing looks gorgeous, as usual, but for all its gorgeosity it reads so slowly. I’d much rather have a comic book plotted with stick figures, than this lovely-looking series that advances about ninety seconds per issue. Which means this revolution against Corum Rath should conclude by 2050. 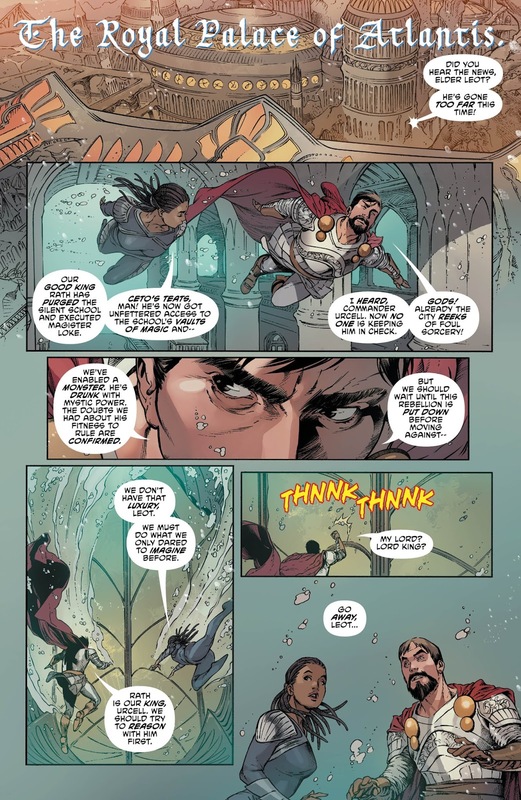 All of the disparate elements from the last dozen or so issues...almost come to bear here. They're about to. I can just taste it. Something is going to happen in this comic book series soon, and when it does, you'll be laughing out of the other side of your neck, jack! Am I the only whom Howard Porter art irks?